Createspace Independent Publishing Platform, 9781536964516, 322pp. Teenager Jane Benedict is awakened by her father and ordered to memorize a mysterious code. Hours later, Mathias Benedict is dead and Jane and her brother, Will, are wards of United Earth Corporation. To evade the company's murderous clutches and uncover the meaning of her father's last message, Jane leads Will on a desperate escape across the galaxy aboard the Freetrader smuggler ship, Solar Vortex. Tangled in the crew's fight against UEC, Jane saves the life of young smuggler Maclan Sawyer and learns her father's code identifies a secret cargo shipment that can spell destruction for the entire Freetrader cause and the extinction of an alien race. 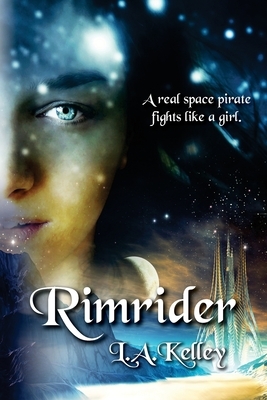 Piracy, intrigue, romance, and a daring rebellion from Earth wait on the planet Rimrock. Will Jane answer the call to adventure and find new purpose on the galactic rim or will death for high treason be her fate? I live in Florida and write fantasy and science fiction adventure stories with smart female characters (no whiners allowed.) Florida is a good place for speculative fiction since most people speculate the heat and humidity here have driven us all slightly mad. In my spare time I enjoy calling in Bigfoot sightings to the Department of Fish and Wildlife. They are heartily sick of hearing from me.